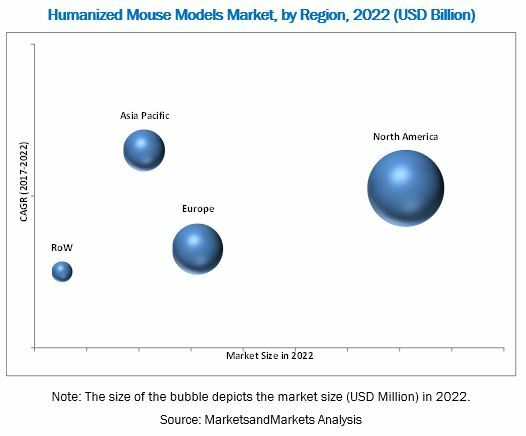 [189 Pages Report] The humanized mouse models market is projected to reach USD 128.9 Million by 2022 from USD 73.9 Million in 2016, at a CAGR of 9.9% during the forecast period. The humanized rat models market is expected to reach USD 8.9 Million by 2022 from USD 5.6 Million in 2016, at a CAGR of 8.4% during the forecast period. The key factors propelling the growth of the market are the increasing number of research activities involving humanized models, growing demand for personalized medicine, increasing number of R&D activities in pharmaceutical and biotechnology companies, and continuous support in the form of investments and grants from the government and private sectors. Increased production of monoclonal antibodies and rising demand for humanized rat models are expected to provide a wide range of growth opportunities for players in the market. Base year considered for the report is 2016 and the forecast period is 2017–2022. The prominent players in the global humanized mouse and rat models market are The Jackson Laboratory (US), Taconic Biosciences, Inc. (US), and Horizon Discovery Group plc (UK). The humanized mouse models market is projected to reach USD 128.9 Million by 2022 from USD 80.3 Million in 2017, at a CAGR of 9.9% during the forecast period. The humanized rat models market is expected to reach USD 8.9 Million by 2022 from USD 5.9 Million in 2017, at a CAGR of 8.4% during the forecast period. The key factors boosting market growth are increasing number of R&D activities in pharmaceutical and biotechnology companies, increasing number of research activities involving humanized models, continuous support in the form of investments and grants from the government and private sectors, and growing demand for personalized medicine. By type, the humanized mouse models market is segmented into genetic and cell-based humanized mouse models. In 2017, the genetic models segment accounted for the largest share of the humanized mouse models market. The factors contributing to the large share of this segment include its widespread use in compound analysis and biological efficacy & safety testing. Furthermore, the cell-based humanized mouse models is categorized into CD34, PBMC, and BLT humanized mouse models. In 2017, the CD34 models segment accounted for the largest share of the cell-based humanized mouse models market and is expected to register the highest growth rate during the forecast period. The major factors driving the growth of this market are usage of CD34 mouse models in in-vivo platforms for analyzing the safety and effectiveness of potential new drugs that can modulate the immune system. They are used for long-term studies in the fields of immuno-oncology, infectious disease, and graft versus host disease. Thus, the growing application areas of CD34 models are expected to trigger the demand for these models in the coming years. By application, the humanized mouse models market is segmented into oncology, immunology and infectious diseases, neuroscience, hematopoiesis, toxicology, and other applications. The oncology segment is estimated to grow at the highest CAGR owing to factors such as increasing research activities and growing funding from various governments to carry out research studies on cancer. By end user, the humanized mouse models market is segmented into pharmaceutical & biotechnology companies, contract research organizations (CROs), and academic & research institutions. The pharmaceutical & biotechnology companies segment accounted for the largest share of the humanized mouse models market in 2017. However, the contract research organizations (CROs) segment of the market is projected to grow at the highest CAGR during the forecast period. 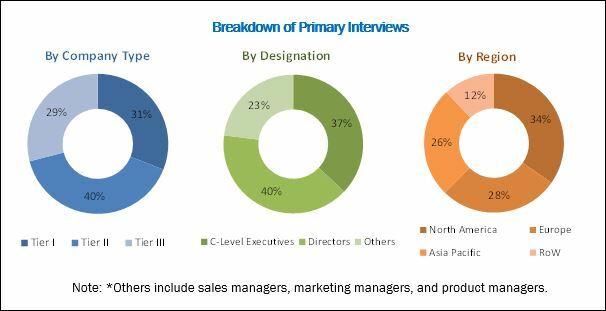 Increasing number of pharmaceutical companies outsourcing their preclinical studies to contract research organizations (CROs) is one of the factors contributing to the growth of this segment. By region, the humanized mouse models market is segmented as North America, Europe, Asia Pacific, and RoW. Asia Pacific is expected to grow at the highest CAGR owing to international alliances for R&D activities in China, initiatives to reduce approval time for drugs, mandatory animal testing for all pharmaceutical drugs and cosmetics in China, increasing investments from the government and private sectors in China’s life sciences sector, growing biomedical and medical research, and research in regenerative medicine in Japan. Furthermore, the growth of the biomedical industry in India, development of bio-clusters to boost India’s biotechnology, growth in translational and biomedical research in Singapore, increase in animal research in Malaysia, and ongoing biomedical research activities in Australia are also driving the growth of the market in Asia Pacific. Factors such as high cost of humanized models and stringent guidelines regarding the ethical use of animals in cancer research are expected to limit the growth of the market to a certain extent. The major market players in the humanized mouse models market include The Jackson Laboratory (US), Taconic Biosciences, Inc. (US), Horizon Discovery Group plc (UK), genOway, S.A. (France), Charles River Laboratories (US), Harbour Antibodies BV (China), Hera BioLabs (US), Vitalstar Biotechnology Co., Ltd. (China), inGenious Targeting Laboratory (US), AXENIS S.A.S (France), Crown Bioscience, Inc. (US), Transgenic, Inc. (Japan), and Champions Oncology, Inc. (US). The major players in the humanized rat models market include Horizon Discovery Group plc (UK), Hera BioLabs (US), and Yecuris Corporation (US).